Irvington Police Director Joseph Santiago, seen here in a file photo, sent an 18-page report to the Essex County Prosecutor's Office that blames actions taken by the town's council and police chief for a major spike in crime last year. Homicides nearly doubled in Irvington last year. 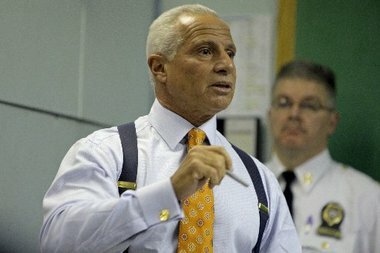 IRVINGTON — The township's police director has sent an 18-page report to the Essex County Prosecutor’s Office stating the town’s acting police chief and council were playing politics with public safety as gun violence soared last year, according to documents obtained by The Star-Ledger. In the report, Police Director Joseph Santiago accuses acting Police Chief Dwayne Mitchell of dismantling a unit that patrolled the Newark-Irvington border, a hot spot for violent crime, and refusing to re-deploy detectives to work at times when homicides and shootings are most likely to occur. Mitchell has filed complaints with the prosecutor as well, saying Santiago has repeatedly overstepped his powers as director, Council President D. Bilal Beasley said. Calls to Mitchell were not returned. There were 16 homicides and 42 shootings in Irvington last year, up from nine killings and 19 shootings in 2012. Robberies that involved a firearm also increased, from 140 to 226, a 61 percent jump, records show. Santiago said he believes Mitchell’s actions, as well as the council’s decision to adopt an ordinance last May that limited the police director’s powers, were retribution for Santiago’s decision to suspend Police Chief Michael Chase in 2012. In December 2012, Santiago charged Chase with 130 violations of police regulations and Attorney General’s Office guidelines after a prosecutor’s office investigation sustained complaints that Chase mismanaged the town’s internal affairs unit and ordered detectives to quash an investigation into misconduct by his police officer nephew. Chase was suspended indefinitely, but his disciplinary hearing has yet to conclude. The chief has earned nearly $180,000 in salary despite not working for the past 14 months. The state Civil Service Commission launched an investigation after an inquiry from The Star-Ledger last year. In his report, Santiago said he supplied Mitchell with data that showed nearly all homicides and shootings were happening between Wednesdays and Sundays, while a third of all homicides occurred on Sundays. Mitchell ignored his requests to re-deploy officers to work at those times, Santiago said. Santiago’s data, compiled from town crime reports and internal documents, shows homicides tripled and shootings more than doubled during the second half of 2013, after the council passed an ordinance severely limiting his powers and barring him from attending crime strategy meetings. Beasley, the council president, scoffed at the idea the ordinance had anything to do with the crime increase. Mayor Wayne Smith was loathe to blame the crime spike on any one factor, but noted that homicides and shootings had declined sharply since Santiago became police director in 2008. He suggested the council loosen the restrictions. Acting Essex County Prosecutor Carolyn Murray confirmed she received Santiago’s report, and while her office will not take any immediate action, she said the year-long crime surge was troubling.